In The Mask of Masculinity (a USA Today bestseller), Howes exposes the ultimate emptiness of the Material Mask, the man who chases wealth above all things; the cowering vulnerability that hides behind the Joker and Stoic Masks of men who never show real emotion; and the destructiveness of the Invincible and Aggressive Masks worn by men who take insane risks or can never back down from a fight. He teaches men how to break through the walls that hold them back and shows women how they can better understand the men in their lives. It’s not easy, but if you want to love, be loved, and live a great life, then it’s an odyssey of self-discovery that all modern men must make. 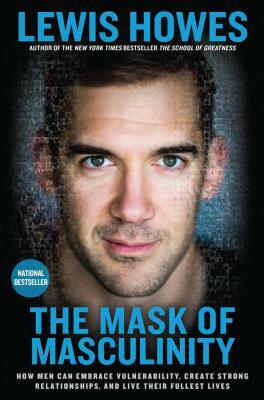 Lewis Howes is the New York Times bestselling author of The School of Greatness, and a lifestyle entrepreneur. A former professional football player and two-sport All-American, he is a current USA Men’s National Handball Team athlete. His podcast The School of Greatness, which has over 30 million downloads, is one of the top 100 ranked podcasts in the world on iTunes. He was recognized by the White House and President Obama as one of the top 100 entrepreneurs in the country under 30. He and his work have been featured The New York Times, People, Forbes, ESPN, Sports Illustrated, Men’s Health, Fox and Friends, The Today Show, and other major media outlets. Originally from Ohio, Howes now lives in Los Angeles, CA. “This is one of the most important topics today that seemingly no one is talking about: how men can take care of their emotional health in a 21st century that demands it. Crucial reading for any young or struggling man." “The rigid ideas our culture teaches us about masculinity and femininity make it nearly impossible for real men and women to truly see and love each other. For men who want to free themselves from cultural cages—Howes’book is a life changer. For women who want to offer the men in their lives permission to be fully human—The Mask of masculinity is a vital tool. This book has the power to change lives,relationships, and our culture." "The single most important book I've read on what it means to be a man. I laughed. I cried. It's a page turner that will rock you. If you're raising a son, read this book. Have a father or a brother? Read this book. Just read this book. You'll love it and be a better human because of it."